As featured in the New Paper on 9 July 2015, our very own Haikal Ismail, the reigning National Schools 2015 ‘A’ Division boys’ 100m and 200m Champion, has been nominated for The New Paper School Sports Star Award 2015. Help him get into the Top 5! The article also makes a brief mention of our late athlete Zaki Sapari, who although now departed, will always remain in our hearts as a part of the Club ZOOM family. Around the track, Haikal Ismail could see fellow sprinters and teammates offering words of encouragement to one another. He was a little envious because, as Millennia Institute’s (MI) sole representative in the A Division boys’ 100m and 200m events, he didn’t have such support. His school didn’t even have a track team, but that didn’t stop Haikal (above). The 20-year-old stood out from everyone else by storming to a golden double at the National Schools Track and Field Championships in April. Speaking to The New Paper recently, he said: “It is a great accomplishment for me to win both events, since this is my very last year running in the nationals. His teacher-in-charge, Shawn Ang, hopes that Haikal’s story can inspire his schoolmates. “A lot of the students were excited by Haikal winning the two finals,” he said. “Maybe if they (new students) see Haikal, they will choose to pursue it (track). 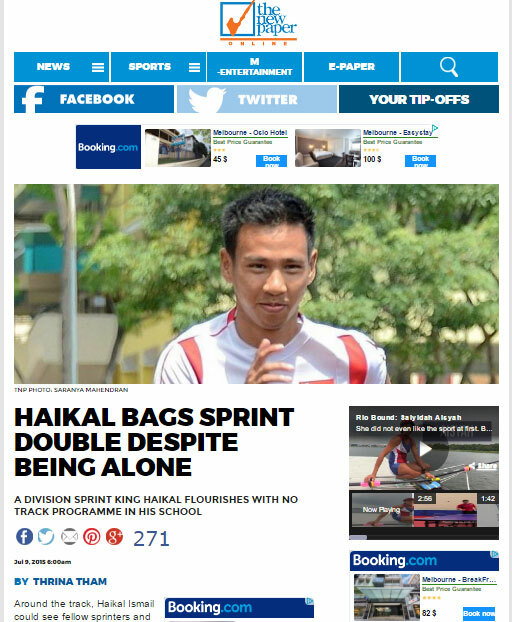 Overcoming the odds is nothing new to Haikal. He was born asthmatic and his mum had enrolled him in swimming lessons to strengthen his breathing. At the age of 10, he won his first track medal – a silver in the 800m event at the National Primary Schools Track and Field Championships – wearing a pair of jogging shoes. To pursue his interest and hone his technique further, he joined Club Zoom, a track and field club. When he joined MI, he briefly gave up track because there was no team. He took up football instead and even made the school team. However, the death of his childhood friend Zaki Sapari in a motorcycle accident in February 2014 eventually made him switch back to sprinting. Zaki ran for Singapore in the 400m hurdles and 4x400m relay at the 2011 SEA Games. Whipping himself back in shape in just three months wasn’t easy, especially when he had to prepare for his A levels as well. “I would meet my teachers for consultation after school, then rush off for training,” he said. He won the 100m in 11.02sec, a personal best, and was also unbeatable in the 200m. Ang recalled Haikal’s disappointment over not going under 11 seconds, and he says that kind of drive will ensure he succeeds in whatever he does.